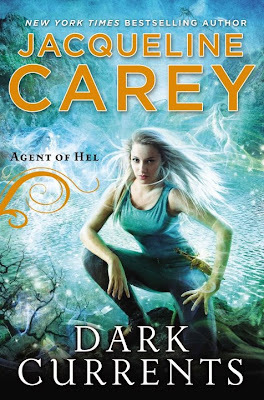 Dark Currents (Published October 2, 2012 by Roc) is the start of Jacqueline Carey's new urban fantasy series, Agent of Hel. (That's Hel the Norse goddess, mind you, not the infernal dimension.) Carey is most famous for the Kushiel's Legacy series, but she's got several others out there. Her website says there are two forthcoming books in this new series, so we've probably got a trilogy on our hands. Our protagonist, Daisy, is hell-spawn (yes, the infernal kind this time) courtesy of an accident with an ouija board. However, she doesn't have any fancy powers. She knows how the eldritch community works, she's sensitive to the seven deadlies, and she's got a tail. She could have all the power she wanted, if she invited her demonic father to Earth and started the apocalypse. However, despite all his tempting, she hasn't — yet. Daisy lives in Hel's territory on earth and works as Hel's liaison between the eldritch and human communities. In terms of world-building, the setting is a catch-all for mythology. Any mythos could be real, somewhere, and none are more prominent than any others. Hel may be head goddess in Daisy's small town, but there are fairies, vampires, trolls, werewolves, ghouls, and mermaids; there are tarot and runic readings. Happily for me, although vampires are a major player in town, they aren't in this book: instead, Carey focuses more on ghouls. Her interpretation is interesting, like vampires that feed on emotions instead of blood, and it's pretty cool. It's also incredibly relevant to some of the problems Daisy deals with by virtue of being hell-spawn. The story does follow the now classic urban fantasy set-up of our protagonist investigating a murder. Daisy is with the police department in a semi-official capacity, but she isn't actually a detective; since she isn't the lead on the investigation, Carey gets to skip on most of the police procedural details. I appreciated that there was no clear love interest. By the end of the book, Daisy is sort of interested in three different people who may or may not be romantically interested in her. I like this because it felt real: she has no idea what's going on with any of them, and the book isn't obviously pushing her into a relationship with any or all of them. I also really liked all the other subplots in this book. There's an investigation going on, but life doesn't stop: her best friend still has family problems, Daisy still visits her mother, and she interacts with people from earlier in her life who don't have any bearing on the investigation. Daisy had relationships with people in town that suggested a lot about her character and gave her more of a sense of history, as well as fleshing out the world. I point this out because too many stories have a token friend or family member that is the “normal” person in the protagonist's life, and I think Carey avoided that problem neatly and made her solution help her besides. In the end, it was obvious that none of Daisy's contacts, physical strength, or investigative acumen were going to save her, and Carey sneakily spent the whole book ensuring that she had exactly what she needed to be a true hero. The trappings may be familiar to urban fantasy readers, but I think Jacqueline Carey is doing something special with Dark Currents. The fantastic is the dressing to tackle serious, “mundane” issues, and it makes for a compelling read. While I liked this novel, it didn't have nearly the depth or intrigue that I've grown used to from Jacqueline Carey. While I applaud her for her foray into a new genre (for her), I felt that there just wasn't enough intensity to the story. While I like her protagonist, Daisy, she's somewhat predictable and pales in comparison to the Outcast, Stefan, about whom there remains a great deal of mystery. I look forward to finding out more about him in the subsequent two novels in this trilogy and I hope that encounters between him and Daisy prove to be more than a dance around the truths they each harbor.